Andrew Marshall is a Pentagon legend. For more than four decades he has served as Director of the Office of Net Assessment, the Pentagon’s internal think tank, under twelve defense secretaries and eight administrations. Yet Marshall has been on the cutting edge of strategic thinking even longer than that. At the Rand Corporation during its golden age in the 1950s and early 1960s, Marshall helped formulate bedrock concepts of US nuclear strategy that endure to this day; later, at the Pentagon, he pioneered the development of “net assessment”—a new analytic framework for understanding the long-term military competition between the United States and the Soviet Union. Following the Cold War, Marshall successfully used net assessment to anticipate emerging disruptive shifts in military affairs, including the revolution in precision warfare and the rise of China as a major strategic rival of the United States. 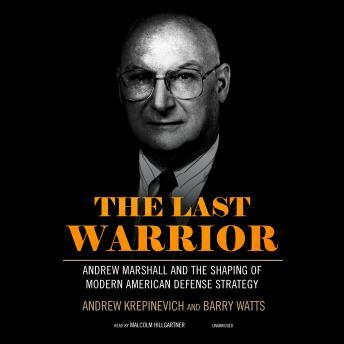 In The Last Warrior, Andrew Krepinevich and Barry Watts—both former members of Marshall’s staff—trace Marshall’s intellectual development from his upbringing in Detroit during the Great Depression to his decades in Washington as an influential behind-the-scenes advisor on American defense strategy. The result is a unique insider’s perspective on the changes in US strategy from the dawn of the Cold War to the present day. Covering some of the most pivotal episodes of the last half century and peopled with some of the era’s most influential figures, The Last Warrior tells Marshall’s story for the first time, in the process providing an unparalleled history of the evolution of the American defense establishment.